Monaghan bounced back from their shock Ulster SFC semi-final defeat by Down with a convincing win over Wexford in Round 2B of the All-Ireland qualifiers. Fintan Kelly and Karl O'Connell goals helped the Farney County to a 2-10 to 0-5 half-time lead, with Ben Brosnan finding the net soon after the break. Kieran Duffy grabbed Monaghan's third goal as his side bossed the game to book a place in Monday's Round 3B draw. Wexford had three players sent-off in the second half, as well as Kelly. 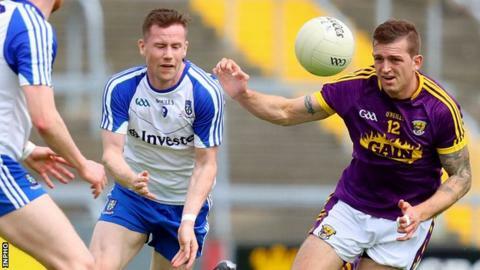 Kelly and Ciaran Lyng were dismissed for two yellow card offences, while Adrian Flynn was flashed a black card four minutes later, with Wexford having used their six substitutes. Substitute John Leacy was shown a straight red card moments later. Monaghan will be joined in Monday morning's qualifier draw by Tipperary, conquerors of Cavan, Carlow, who saw off Leitrim, and Armagh, who saw off Westmeath. The match pitted Wexford manager Seamus McEnaney against his native county, whom he guided to two Ulster finals in 2007 and 2010 during a six-year tenure from 2005 to 2010. In his first season in charge of Wexford, McEnaney saw his side lose to Carlow in the first round of the Leinster SFC, before edging out Limerick by a point in the first round of the qualifiers. Monaghan, who saw off Cavan in Ulster, before losing to Down, made four changes to their starting line-up prior to throw-in, with Dessie Mone, Gavin Doogan, Shane Carey and Dermot Malone replacing Vinny Corey, Darren Hughes, Kieran Duffy and Conor McCarthy. From the outset, the Ulster county appeared determined to ensure that there would be no repeat of their surprise three-point demise to Longford at the same stage of the All-Ireland series last year. Jack McCarron played a part in fashioning both first-half goals, Kelly firing a left-foot strike into the bottom corner in the seventh minute and midfielder O'Connell finding the back of the net in the 26th. A black card for Conor McManus did little to dent Monaghan's superiority as they built up an 11-point advantage at the interval. Brosnan's goal proved a mere consolation as the visitors continued to pile up the points, Duffy's well executed goal a deserved reward for their supremacy throughout. Fifteen players in total got their names on the scoresheet for the victors, Kieran Duffy top-scoring with 1-2 and McCarthy contributing four points. McCarron and Kieran Hughes weighed in with three scores apiece.